Winter Solstice and Long Barrows. 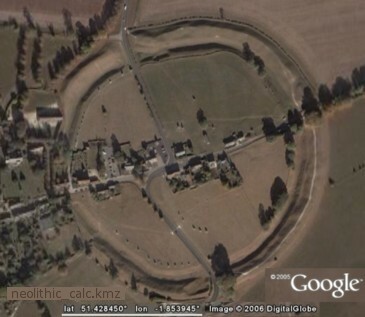 Astronomy Constants and the Avebury Landscape? and the Avebury Landscape? Perhaps. 2007.12.22 - I need accurate GPS readings for Avebury's monumental landscape. A recent inquiry led to assessing geospatial ordering of several Neolithic long barrows on the British Isle. The two largest are both near Avebury. West Kennet Long Barrow and East Kennet Long Barrow are 330-350 feet long and up to 120 feet wide and 20 feet high. The arc distance between their centerpoints presents the value of days per lunar orbit, an astronomical constant. 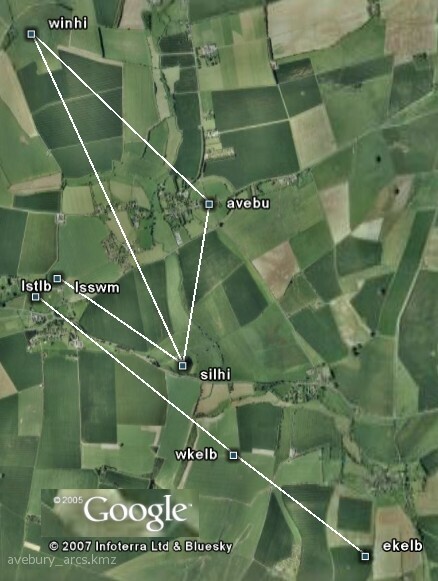 The Avebury to Silbury Hill arc (avebu-silhi = 0.013070°) is nearly the same length as that between these largest of long barrows (wkelb-ekelb = 0.013178°). The slight difference between the two arcs is 12 m. Both arcs present astronomical constants, days per lunar orbit and days per lunar anomalistic period. The anomalistic period is 27.55455 days and sidereal orbit was 27.32167 days. Dividing circumference (cir) by these constants times 1,000 equals the monument arcs, i.e. cir / 27,321.67 = 0.013176°. The following actual distances and astronomy equivalent arcs provide an idea of the scale and the comparison illustrates the accuracy. The sub-meter inaccuracy is less than the precision expected of the coordinates. Consideration of accuracy of methods—basically "When is close close enough? "—is very distinct from considering builder intent. Precise does not by itself assure a positive answer to intentionality. If the builders intended to monumentalize the lunar constant with the arc length, further evidence is needed to support this hypothetical. I've turned to examining the monument geometry further, wondering, "Do other aspects of this landscape geometry also infer intentional arrangment?" 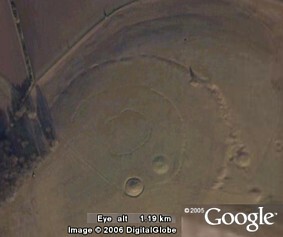 The Kennet barrows align on Longstone Long Barrow, a position less precisely discernable in Google Earth (GE). With that caveat, the geometry these three points form seems intentional. More on this below, after short descriptions of the sites collected from several sources. The Avebury Arcs GE file provides further visual description. East Kennet Long Barrow. A Late Neolithic chambered long barrow dating from c. 3500 BC, a substantial earthwork orientated north-west/south-east, broadly rectangular, 106m long by 50m wide and c8m high, largest long barrow in the British Isles, with sarsen stones at the southern end. Silbury Hill and surrounding countryside views are magnificent in all directions. Excavated in the 19th century, flanking ditches quarried during construction parallel to the south-west and north-east sides survive to a width of c5m as a low earthwork on the north-east. West Kennet Long Barrow. 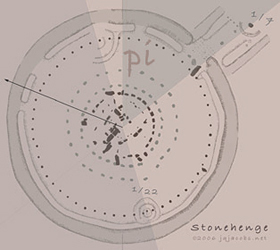 A Late Neolithic chambered long barrow dating from c. 3700 BC, 340 feet long, 75 feet wide, oriented E-W, with eastern entrance 12 feet high standing stones. Passage extends 40 feet to five sarsen stone chambers. The trapezoidal mound is formed with a sarsen boulder core and chalk rubble capping from flanking quarry ditches. The elaborate megalithic structure on the east end of the mound includes an axial passage with five chambers. The massive sarsen facade, aligned north-south, has a semi-circular forecourt. Long Stones Long Barrow. A Neolithic long barrow dating from c.4000-3500 BC, 225 feet long, 120 feet wide, 15 feet high. Located due south of Windmill Hill. Windmill Hill dates from c. 3,500 BC. Silbury Hill Mound. Covering over 5 acres, the massive flat top mound standing 130 feet high was built starting between 2445 and 2190 BC, per radiocarbon dating. Silbury Hill is the largest prehistoric man-made mound in Europe. English Heritage reports 30 metres high and 160 metres wide, roughly 4 million hours of work, and 500,000 tonnes of mostly chalk from surrounding terraces and ditches. Windmill Hill Henge. Dating to near 3500 BCE, the Neolithic causewayed enclosure is one of the oldest of the Avebury monuments. The type-site and largest 'causewayed camp' (a henge type) and type-site for 'Windmill Hill culture' pottery consists of three concentric circular/elliptical banks and ditches 365m in outer diameter. Avebury is described in a previous Neolithic Monuments web log. 2007.12.28 - Winter Solstice and Long Barrows ... the solstice has passed, but I'm not passing over the solstice aspect of this topic. 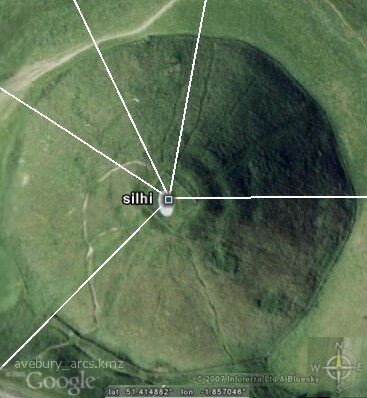 I noted several other angles matching the arc distance from Avebury to Silbury Hill, both the winter solstice angle and the bearing to Mont Blanc. In the previous post, I discussed summer solstice sunset at Avebury aligning to Newgrange when obliquity equaled 24 degrees (±2,758 BCE). In opposition is winter solstice sunrise. These two major site concentrations, at Newgrange and Avebury, align on Mont Blanc—the highest point in Western Europe. Coincidentally, at the Avebury concentration, winter solstice azimuth is the same as the Mont Blanc bearing. Winter solstice sunrise at the Silbury Hill to East Kennet latitudes ranged from 130.72° to 130.71° E. of N (using GeoAstro formulated by Victor Reijs). The bearings to the present-day Mont Blanc summit range between 130.74° and 130.71°. Air temperature variation alters the solstice angle more than this degree of swing. The solstice angle changes near 0.02° per century due to the change in obliquity, in earth's rotation axis angle. The bearing to the mountain is relatively fixed, albeit secular polar motion has altered latitudes and polar azimuth slightly given the age of these monuments. Ice, of course, changes on the mountain. One ten-thousandth of the solstice angle equals the Avebury-Silbury Hill arc distance (0.01307°) even with the slight variations in angles below given the fifth decimal of a degree of arc (0.00001°) is a mere yard in length. Mont Blanc (monbl) presents a fixed mountain in the same direction as the temporally variable solstice. In assessing possible intentions, the Occam's razor choice only needs correlate the local factors, Avebury to Silbury Hill arc and the solstice angle. These hypothetical intentional distances infer scaling the earth accurately and likely, also, equating the Kennet barrows arc to lunar orbit. Without the question of knowledge of the bearing to a distant mountain entering consideration, equating the monument arc length with another angle infers accurately scaling the earth. Equating the arc length with an astronomic constant does also, and adds the inference of astronomical knowledge. No matter which inference, scaling the earth is a significant accomplishment to ponder for 5,500 years ago, and a uniquely evidenced one too. I end where I started—I could use accurate GPS readings or survey equivalent. With intra-site and intra-complex distances, the original builders could measure directly and position precisely. To examine same, we need the same resolution. Understanding these awesome ancient monuments presents real challenges to both method and theory. The greatest of them present geospatial relationships uniquely evidencing prehistory and challenging our understandings of the past. The two largest long barrows are no exception. 2007.10.04 - Google Earth updates Bend of the Boyne. The new aerial imagery is quite high resolution. Download the Google Earth placemarks file, boyne.kmz, or use the coordinates below to locate a specific monument. Winter Solstice Webcast. Stonehenge, Avebury and Associated Sites UNESCO site. Avebury World Heritage Site, Kennet District Council "including remains of the largest stone circle in the British Isles, the longest stone avenue (West Kennet), one of the longest Neolithic burial mounds (West Kennet long barrow), one of the largest causewayed enclosures (Windmill Hill), and the largest prehistoric mound in Europe (Silbury Hill)." 2007.03.02 - Ancient Peruvian Astronomical Observatory at Chankillo. 2006.11.27 - New GE placemarks page ../blog/placemarks.html. 2006.11.14 - New images for the Machu Picchu Photo Gallery. Image updates: Teotihuacan ruins and mural art, Betatakin, Vernal Rock Art. 2006.10.12 - Online spreadsheets: neolithic_calc.xls and archaeogeodesy.xls. 2006.06 - New Photo Gallery, Ancient Earthworks of the Eastern Woodlands. Eastern Woodlands GPS Placemarks with Squier map overlays. as focal points in the landscape, involving the horizon, the sky and the land." © 2008 by James Q. Jacobs. All Rights Reserved.